John trained in Graphics and Illustration at Guildford College of Art in the south of England, followed by four years in design studios in London before becoming a freelance illustrator in 1972. 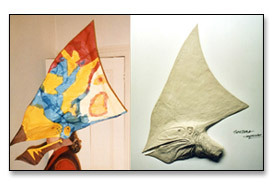 His original artwork has toured in group shows such as "Dinosaurs a Global View" and he has had numerous one man shows in the UK and in Spain in 2007. He has also illustrated a number of mythology books published by Eurobook and fantasy books by Puffin. Notable exhibitions include the Dinosaur Gallery in London's Natural History Museum, Beginnings in the Museum of Scotland, Edinburgh, the Gamagori Museum in Japan and the Sea Dragons Gallery in Bristol. The first stage of any commission is to go to the fossil evidence, and consult with specialists in the field. John then works out a number of sketches to build up an overall picture of structure, behaviour, and surface detail. 3-D models are a great help in working out lighting and various viewpoints. When all the elements are agreed on he works on the finished piece. Paintings are executed in gouache and finished drawings in pen and ink, or different types of pencils. 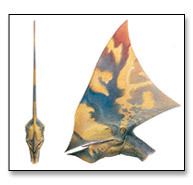 Tapejara imperator - mid cretaceous pterosaur from Brazil.